Like all our prior blog polls, this post takes a moment to memorialize the results we received on the most recent blog poll. 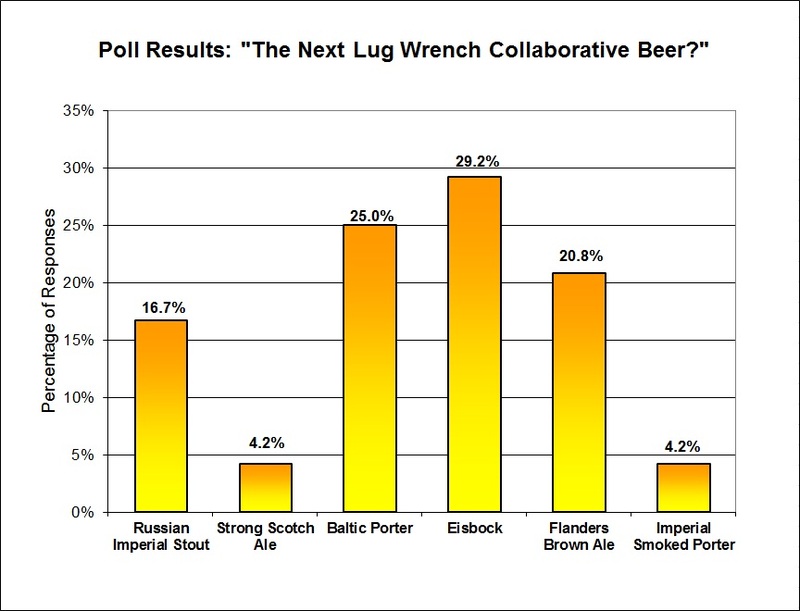 The readers' responses to the question "For the next Lug Wrench Collaborative Beer, what beer should we brew?" are presented below. It looks like we'll be lagering! 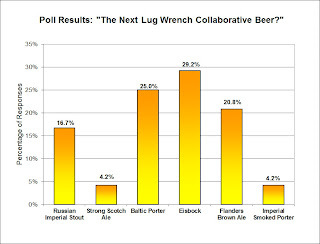 The race was awefully tight between Baltic Porter, Eisbock, and Flanders Brown Ale. Just about every day, Tom and I would be checking the results and one of those three would edge up a vote, keeping it a close race. But it looks like we'll be brewing German this weekend after all. The recipe for the beer will most likely be from Jamil's book Brewing Classic Styles, as its pretty much the only trustworthy recipe I've been able to come across (does anyone know any others)? Additionally, I've spent some time listening to Jamil's description of the style on the Brewing Network's Jamil's Show to get a better feel for how the beer will be 'iced' after the lagering process. Wish us luck! I'll likely be posting on the brew day in the coming week or two. The most successful icing method I've heard of that's worked is to put the finished keg into a freezer, at full on freezing temperature, and take it out and shake it every 20-30 minutes for 18 hours. This makes a very even slush, without letting the "out" freeze up. Then push the beer into a second keg with CO2, the ice slurry stays behind!